Cygnet Accommodation | Thinking about a holiday or a short break in Cygnet? Cherryview is a stylishly appointed self-contained studio apartment which sleeps two in a luxurious king-sized bed. 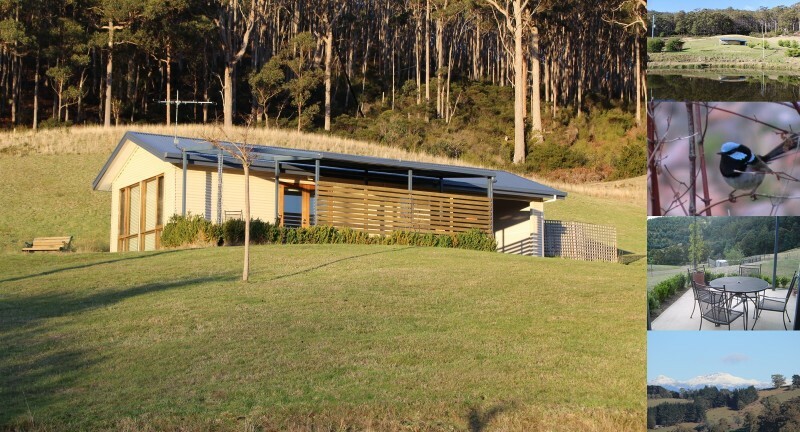 It is located on a bush block at Cygnet, part of the beautiful Huon Valley. It is only a 45 minute scenic drive from Hobart and is the perfect base for relaxing & exploring Cygnet and Southern Tasmania. Relax in elegant luxury at the studio located on a whisper quiet 25 acre location and take in the breathtaking views of springtime cherry blossoms, vivid autumn colours, winter snow-capped mountains, and rolling green hills and some amazing sunsets. You can relax on the patio and listen to the frogs while taking in the magnificent scenery and the bird life – blue wrens and robins abound and wedge tailed eagles regularly soar over the Cherryview. You can also wander the property at your leisure and meet the permanent residents Gina the donkey & Annie the pony! In the evening you can take in the beautiful sunsets and then watch out for the abundant native wildlife including pademelons, bettongs, bandicoots, quolls, possums and wallabies. On clear nights the minimal ambient light means that you will get a fabulous view of the stars. Cherry View has the perfect mix of modern day amenity and peace and tranquility without total isolation. For those needing to work or keep in touch with others, your Telstra wireless broadband and mobile phone will definitely work. Please have a look around our website and contact us should you wish to enquire about booking a stay at Cherryview.